Following Elaine Ng (吳綺莉) and Jackie Chan’s (成龍) 19-year-old daughter Etta Ng’s (吳卓林) marriage announcement, Jackie announced the English version of his biography, Never Grow Up, will be released on December 4. In the book, he admitted to his affair with Elaine but failed to acknowledge Etta as his daughter despite the public’s knowledge. Last night, the mother wrote a heartfelt message on social media and compared her daughter’s ill fate to hers. After sharing that she grew up without a father, Elaine’s friends and netizens commented on her post to show support and asked her not to mind the gossip. She responded to the positive response by saying Etta is her only priority, and she will not be impacted by other small stuff. Although she previously did not want to talk about Etta’s marriage to her girlfriend, Internet personality Andi Autumn, the mother still sent her blessings. Now that her daughter has returned to Hong Kong, and Elaine has also seen her, her friends and netizens believe Etta will definitely feel her love. 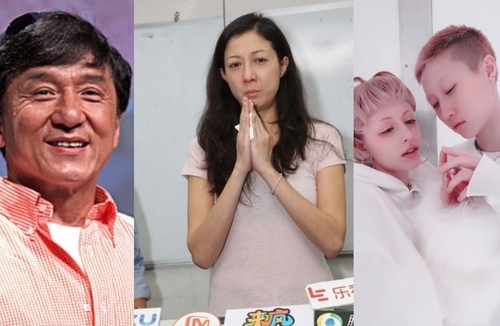 Jacky Chan’s treatment towards his own daughter is a major disgrace. He is a coward. It takes “1 pair” of hands to slap… Thou Jackie Chan might be a major disgrace and probably the biggest coward in known history. Elaine is not all innocent to the situation. She knew Jackie had a wife at the time of the affair, it was public knowledge. So, that doesn’t make her all right to the situation at all. Disgrace to both parties. Yes, at the end of the day, it is no fault to the daughter. @ricky721 The lust of the parents is no fault of their daughter. Both are equally wrong as adults but why should the innocent child their sire suffer for their mistake? Elaine has supported and clearly love her daughter. She is taking responsibility. Jacky should do the same as her father. He is a big disgrace and coward to deny his responsibility. I have not said Elaine was not in the wrong. Just focus on their daughter. @hohliu I was making a general statement to the situation!! I did not say what Elaine was wrong addressing the matter… Sad…and honestly, Elaine probably can handle it the best that she can given the situation. Like I said there is no fault to the daughter!! Look, JC already exposed and ditched out all the bad and the ugly… Should he do the same to knowledge Etta, yes totally… But, I always wonder, JC already ditched out the down and dirty laundry already, why leave out this one line of acknowledgment?? He would rather be called a “disgrace coward” then to knowledge his biological daughter? Why?? It’s not only a disgrace… It’s a sad and unforgiving situation for both parents to have put this situation on Etta. @ricky721 Sometimes, it is just unbeliever how disgraceful a man like JC can be. Elaine is also a victim of her mistakes and lust. I bet JC make those women he sleeps with take morning after pill after each sessions to make sure none of them get pregnant. He is a scum that can do so. @ricky721 Most of news focus on Elaine and Etta. But what about JC’s family? He betrayed them. I think JC probably promised his wife and son back then that he would has connection whatsoever with Elaine so they would forgive him and accept him back. Acknowledging them now probably would be seen as new betrayal. I have friends and even family members whose fathers cheated on their mothers. Some reconciled, some got divorce. It takes two to tango. But wife will blame the other woman than their husband and as a child it’s really difficult. Especially if it happen in teenage years. If your dad cheat on your mum, you will start asking. How could dad cheat on my mother? Why you treat us like this? I am your son/daughter. Don’t you care about us anymore? And then the blame will start. The one who get is the most is always the other woman. You knew that my dad is married, how could you seduce him? Have you got no shame at all? etc. It’s crazy to hear how people evolve… a lot of people has no shame… when it comes to 3rd party, knowing that the person is married with kids. My close family relative, an aunt decided leave her husband and 2 teenage boys for a another man, who has kids as well… So you tell me!! both sides of the family with kids… It’s sad… People just don’t think. @ricky721 she probably thought she’s hitting the jackpot!! there’s definitely a pattern here. people tend to gravitate towards similar people or environment that they grew up with, as that’s what they’re used to. even if it’s abuse. especially if it’s abuse. maybe subconsciously, elaine considered JC to be a lot like her dad, who is likely to abandon her. she wants to fix that sore spot in her life, so chose him to try her luck. except these things tend to be cyclical. what she hoped to accomplish didn’t happen, and in fact, became a repeat of the tragedy that befell her mother. i wonder if her mother chose a married man as well. let’s hope the same fate doesn’t apply to etta. Yes it is sad that she knows how it’s like to grow up without a father, instead of learning from her mother’s mistake, she took the very exact path as her mother. It even looked as if she decided to allow her children to grew up the same way as hers…by making the choice of sleeping with a married man, otherwise, does she plan to make the married man divorce? The other wife who is innocent would suffer too either way. Maybe it’s one of those cases where a victim just have to repeat things in a cycle. But by no means is JC any better, Elaine and JC both made this terrible mistake together. The kid must’ve been through lots of bullying because of both the parents. @davy yeah…but sometimes, people stuck in these victim roles can’t help themselves. they know it’s wrong, but they repeat what was done to them in a bid to fix what happened to them…when they should’ve just avoided the situation altogether. it takes a lot of self-awareness to remove themselves from these unhealthy entanglements.